Saudi Arabia held a hologram-based concert for late Egyptian diva Oum Kalthoum on 25 January as part of it’s Winter at Tantora Festival. The concert featured the Sounds of Egypt Orchestra, which began the night with a medley of classical Arabic compositions, before a hologram of Oum Kalthoum lit up the stage and animated her greatest hits, such as Alf Leila Wa Leila (1969) and Enta Omri (1964). The hologram was created by the festival organisers: MBC, the UAE-based television broadcaster, and NDP, the Dubai-based production company. Egyptian actress Sabreen, who played Oum Kalthoum in the eponymous 1999 TV ­series, filled in as a body double for the singer during the creation of the hologram. 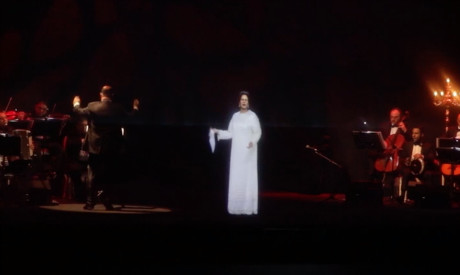 The Oum Kalthoum hologram concert is reportedly set to tour the region during 2019. Winter at Tantora is a month-long festival that began in 20 December 2018 and runs till 9 February 2019 in Saudi Arabian city of Al Ula, some 1,000 kilometres from Riyadh. The festival features a programme of music performances, art exhibitions, sporting events and more, held at the new glass performance space that sits amongst the sandstone mountains of Al Ula. The high profile festival also included concerts by Omar Khairat, Lebanese singer Majida Rumi, Chinese superstar pianist Lang Lang, and will feature Kadim Al-Saher a 500-strong audience, which included regional royalty and diplomatic ambassadors.